Choose Your Own Path, Just Get Moving! America is in the middle of an inactivity crisis. A sedentary lifestyle is as dangerous to your health as smoking and obesity. According to the Centers for Disease Control (CDC) over 78% of the population 18+ does not get the recommended amount of aerobic and strengthening exercise per week. Unfortunately, many of these diseases come with their share of suffering. Sounds Scary!!! Have no Fear. There is a solution. As little as 4 hours per week of appropriate exercise can reduce risk factors to that of a person who sits less than 4 hours per day. In real world terms a regular exercise program will help you to move better, feel better and look better so that you can Love Your Life. While it is never pleasant to think about the end of your life, the cold hard fact is that none of us lives forever. How the end of your life plays out is a complex interaction between your genetics and your environment. While you can’t (yet) control your genetics, you can control how you live your life, which will have a tremendous impact on how your life plays out in the end. The “Cycle of Frailty” ultimately begins with a lack of physical activity which leads to deconditioning and Functional and Cognitive Decline (FCD). Deconditioning leads to disease and or injury which leads to immobilization which leads to further deconditioning continuing the cycle. 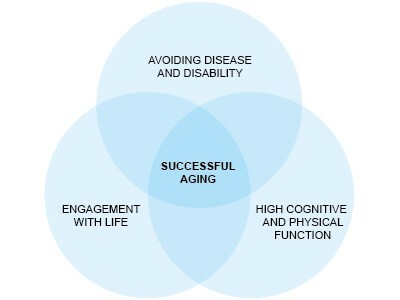 There are 3 main active components to successful aging that all interact with each other. Participation in a medically and scientifically based exercise program will lead to improved physical function which is highly correlated with improved cognitive function. This in turn decreases risk factors for disease and disability and together increases your ability to engage in life. Emily is an 80-year-old female who has participated in a consistent scientifically based exercise program under the guidance of trained professionals following the latest research and guidelines. She participates in 3 fitness classes per week where she has made several new friends and looks forward to swapping stories about life and family as much as she enjoys her workouts. Emily is actively engaged in social activities with her friends and travels regularly to see her family. This past holiday she went to Disney World with her entire family and rode Space Mountain for the first time ever! Emily spends little money each year on healthcare costs aside from her regular checkups and takes few to no medications. Bob is 65 years old. As a former college athlete, he always thought of himself as fit and healthy. After an annual check-up he was faced with his actual reality. He was overweight, had high blood pressure and was borderline diabetic. His doctor told him that he needed to increase his physical activity but gave him no instruction or direction on how to start or where to go. Bob decided to join a big box gym and was set up for an initial introduction with a “personal trainer”. With little to no baseline health screening and testing, Bob was started on a generic exercise program and then turned loose by his trainer. Bob went for two weeks thinking of himself as the college athlete that he once was. While performing inappropriate strengthening exercises and attempting to lift weights that were too heavy, Bob tore his rotator cuff. 9 months and 2 surgeries later Bob has yet to resume an exercise program. He’s still overweight, is dependent on blood pressure medicine and has had to begin medicine to control his blood sugar. He takes a myriad of other medications. Bob had to spend a significant portion of his retirement income on his co-insurance and deductible for surgery and now has ongoing monthly expenses for prescriptions and doctors’ visits. Doris was 80 years old this year. She never participated in any form of exercise. After 10 years of struggling with multiple health issues she passed away. At the age of 76, she was no longer able to live on her own and had to enter a nursing home. At that point, life as Doris knew it would no longer be the same. Because she did not feel well and wasn’t healthy enough to travel she missed the most important moments of her families’ lives. Birthdays, holidays, graduations and family gatherings were all celebrated without her. Financially, Doris’s declining health was devastating. After a lifetime of working and saving every penny, Doris’s entire life savings plus went to the nursing home. On Medicaid (and sharing a room), she no longer had the financial ability to even send her great grandchildren birthday presents. Emily got it right! Bob and Doris struggled and suffered. The choices we make today have an enormous impact on our ability to enjoy life tomorrow. Numerous studies have shown that beginning an exercise program that includes both aerobic exercise and strength training can improve physical and cognitive function REGARDLESS OF AGE. Don’t be Bob or Doris. While nothing in life is guaranteed you owe it to yourself and to your family to do everything possible to age successfully and to Love Your Life. Article written by: Bruce White, MPT, Managing Partner of Fitness for FYZICAL Therapy and Balance Centers of Palm Beach and a member of the Central Palm Beach County Medical Board of Governors. Click here to learn more about the Central Palm Beach County Medical Board of Governors. Bruce is a Physical Therapist with a lifelong passion to help others through medically and scientifically based exercise programs. He is a partner and director of fitness for FYZICAL Therapy and Balance Centers of Palm Beach and can be reached at bwhite@fyzicalpbc.com.